In addition to Cooking day, we also had a winter squash tasting. 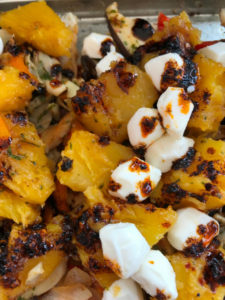 We cooked them very simply to let the flavor of the squash come out. The basic recipe is just to slice them in half, scoop out the seeds( save them for roasting!) and place them cut side down in a dish with about 1 inch of water. Bake at 400 until soft. I also had some cubed and roasted fairy buttercup. Peel squash with a veggie peeler. Then slice squash and cube. Scatter on a baking sheet with olive oil, salt and pepper and roast at 450 until browned, flip and roast the other side too. For most vegetables-when in doubt-roast! Without further ado- here are the recipes from October 5th. 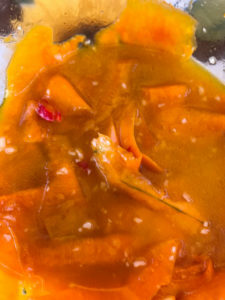 Whisk chile, garlic, orange zest, orange juice, vinegar, oil, and salt in a large bowl to combine. Using a peeler, slice lengthwise strips off long neck of squash to make long ribbons until you have 8 cups (9 oz.). Add to bowl with dressing and toss to coat. Let sit, tossing occasionally, at least 30 minutes and up to 1 hour to tenderize and marinate. Toss in roasted pumpkin seeds, then using tongs, transfer to a serving platter; discard any excess dressing left in bowl. Roasted cabbage,onions and peppers was the next item. 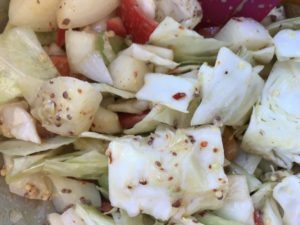 Chop cabbage, onions and peppers to bite sized pieces. Mix together with whole grain mustard, olive oil pepper, paprika and salt and pepper. Place in a pan and roast until tender. Also tasty raw. 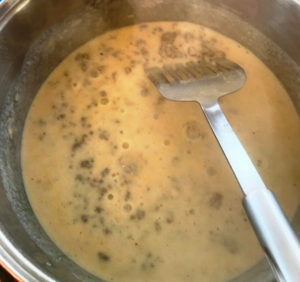 Yes, you can make Biscuits and gravy with a Coleman stove and a grill! Keeping the bowl, butter, egg and milk COLD is very important. Sift together the dry ingredients in a large bowl. Use a pastry cutter to cut in the butter to peas sized pieces. Make a well in the center. Mix together the milk and egg and pour into the bowl. 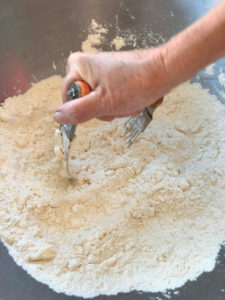 Mix with a fork until the dough comes together. Flatten and fold into thirds, repeat 5 more times.Pat to 3/4 inches. Cut and transfer to baking sheet and bake in a preheated oven( or covered grill) until nicely browned, about 15 minutes. Cook the sausage slow and low until done, do not brown. Add a couple tablespoons to the fat and sausage in the pan and stir just until the flour is absorbed by the fat. Add milk to cover. Bring to a simmer, stirring constantly until sauce thickens. Adding more milk if too thick. Season with white pepper. That was a hard act to follow but Mashed potato codfish cakes fit the bill. Gently mix everything together except the flour. 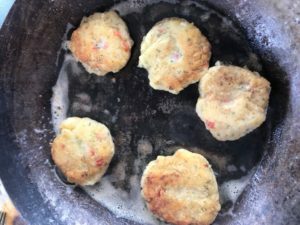 Form mix into patties and dredge in flour. Place in a greased saute pan and brown on both sides over medium heat. Roasted acorn squash with almonds featured a simply baked squash that Jen cut into chunks and finished in saute pan with butter, brown sugar and salt. And a dash of Malcolm’s Madness-found at the West Jefferson Farmers Market. That gave the squash a nice browned exterior and the roasted almonds added a nice crunchy texture. The last item was an absolutely beautiful Open faced roasted veggie sandwich with sauted shitake and golden oyster mushrooms, onions, red bell peppers, sauted cooked squash topped with mozzarella balls and roasted in the covered grill until the cheese melted. The bread was Janie’s Asiago baquette and the mushrooms were from Baywood Forest as well. This entry was posted in Recipes and tagged Chef Jen, cooking day, cooking demonstrations, mushrooms, squash. Bookmark the permalink.